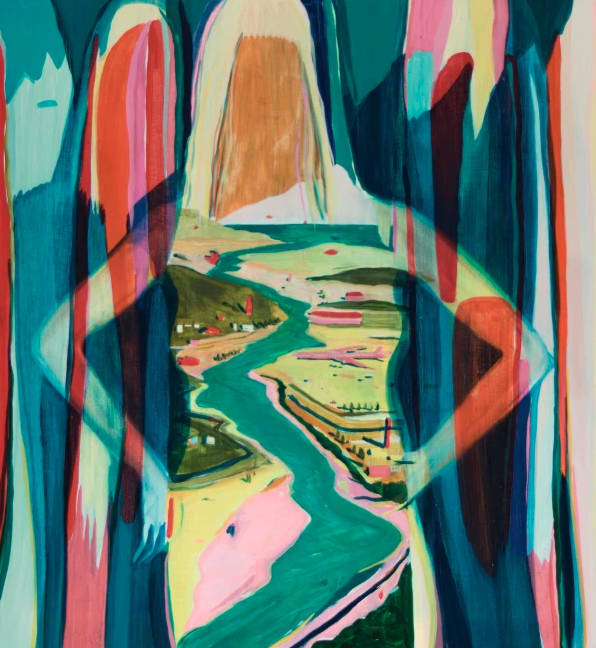 I love it when people use travel as inspiration for their art (like here), so was excited to discover these paintings by Brooklyn-based French artist Jules De Balincourt last night my favourite off-the-beaten-path London gallery. De Balincourt paints familiar scenes – tropical islands, nighttime city scapes, campsites, ski slopes – really rich with atmosphere and detail. Looking at them, I can’t help but feel like I’m watching his adventures unfold and learning his take on the world. The Guardian describes him as: ‘the Hitchcock of the painting world’. Genius. “The French artist’s absorbing canvases create whole worlds, embrace the miracle of being alive – and leave you feeling like Jimmy Stewart in Rear Window“. Jules grew up in California, spent summers in France and now lives in Brooklyn. Looking at the work in his portfolio over the years, you can see how his style has changed as he’s moved around and times have changed. Side note: Jules de Balincourt isn’t new to the art world; only to me. He’s been in lots of big galleries and had plenty of solo shows – including the one I went to at Victoria Miro in London on now and where I discovered his amazing work. ↓ This beautiful snowy scene is of the Metropolitan Opera building in New York and was used on the cover of the December 2008 issue of theatre magazine, Playbill. The show is on until 24 March.